Like most dog parents, you know the kidneys are responsible for producing urine, which is one way the body eliminates waste. But what you might not know is that the kidneys also play an important role in regulating blood pressure. What this means if you have a dog with kidney disease is that your dog is also likely to experience high blood pressure, or hypertension, as kidney disease progresses. In this post, we’ll explain what hypertension is, what signs or symptoms it causes, and why you should have your dog’s blood pressure monitored if your canine companion has kidney disease. Hypertension, which may be commonly referred to as high blood pressure, occurs when your dog’s blood pressure is continuously higher than normal — just as in people. You may have learned in biology, physiology or other health-science class that blood pressure is the amount of force applied by blood to blood vessel walls as the heart beats. It’s usually highest when the heart contracts, pushing blood out into the body, and lowest when the heart relaxes and fills. Veterinarians and physicians typically group hypertension into one of two types: primary or secondary hypertension. Primary hypertension, which is common in people but rare in dogs, is high blood pressure without a known underlying cause. Secondary hypertension refers to high blood pressure that’s caused by another medical condition. In veterinary medicine, secondary hypertension accounts for 80 percent of all high blood pressure diagnoses. By far, chronic kidney disease is the most common cause of hypertension in dogs. Studies suggest 60 to 90 percent of dogs with chronic kidney disease also experience high blood pressure. But there’s more than a simple cause and effect. Not only can kidney disease cause hypertension, but high blood pressure can further damage impaired kidneys and lead to disease progression. In addition to kidney disease, other conditions such as obesity, diabetes and Cushing’s disease (hyperadrenocorticism) can commonly cause high blood pressure in dogs. Still other diseases of the endocrine system such as an overproduction of growth hormone or an adrenal gland tumor can also result in hypertension. Dogs with hypertension may be “subclinical,” meaning the condition is not severe enough for them to show obvious signs; or they display symptoms related to an underlying disease, such as chronic kidney disease. However, persistently high blood pressure can damage the eyes, brain, heart and blood vessels as well as the kidneys and, by the time signs do occur, they may be catastrophic. When a dog is diagnosed with kidney disease, your veterinarian will likely recommend monitoring your dog’s blood pressure if hypertension isn’t already present. 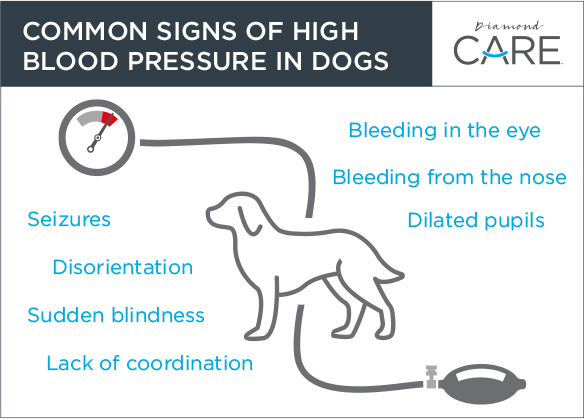 If you’ve had your blood pressure taken, you’ll know what to expect for your canine companion because the procedures are very similar. An inflatable cuff is placed on your dog’s front leg or tail and standard blood pressure measuring equipment will check the pressure. A dog is considered to have high blood pressure if his or her systolic blood pressure (the first or top number in the well-known “120 over 80” measurement) is equal to or greater than 160 (mmHg). Several types of medications are used to control a dog’s blood pressure. Your veterinarian will recommend one that’s appropriate for your dog, based on the severity and underlying cause of hypertension, concurrent diseases and his or her preference. Be aware that your dog will probably need medication to control his or her blood pressure indefinitely. In addition to medication, your veterinarian may recommend a dog food that is lower in sodium. If you’re feeding a kidney-friendly food, such as Diamond CARE Rx Renal Formula for Adult Dogs, chances are that the food’s sodium level is already controlled and no switching of dog food will be necessary. If you’re concerned about your dog’s risk for hypertension or kidney disease, please be sure to discuss your concerns with your veterinarian. After you and your family, your veterinarian is your dog’s best friend.